My main computer in the recording studio is a 2.33 GHz Core 2 Duo MacBook Pro cca. 2007. The hard drive that it came with was only 120 GB, which isn't very big when you have a number of recording projects on the go, lots of photos, iTunes full of tons of music and so on. So I ordered a 320 GB drive and external USB2 enclosure from Other World Computing (only $115 after a rebate). Swapping in the new drive was surprisingly easy. Here are the main steps. 1. 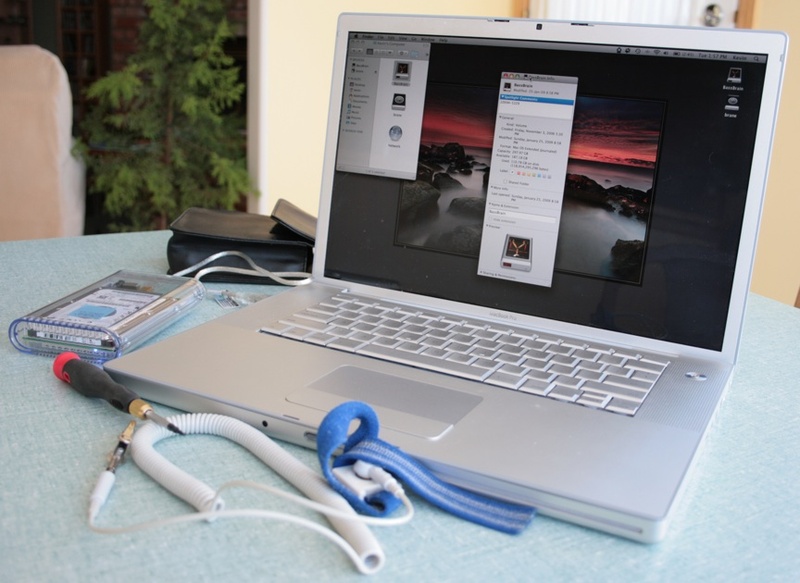 Install the 320 GB drive in the external enclosure, connect it to the MBPro, and format the drive using Apple's Disk Utility. 2. Create a clone of the original 120 GB drive onto the new 320 GB drive. I used an app called SuperDuper. The basic version is free, and it works great. It's very easy to use. 3. Install the new 320 GB drive into the MBPro. Shut down the computer first (obviously)! This is a little tricky, but not to be feared if you're reasonably handy with a screwdriver. The newer MBPros are designed for easy hard drive swapping, but mine wasn't - you have to take the thing apart. I followed a great instructional video from OWC. There are about 24 teensy weensy little itsy bitsy screws, and a couple of flimsy ribbon connectors to handle, so you have to be a little careful. Take your time, keep your little screws organized in the order you take them out, and it's a piece of cake. You'll need an anti-static wrist strap, a Philips #00 screwdriver, a Torx T6 screwdriver, and a strong thin plastic wedge tool for levering off the casing. I used a 1 mm guitar pick for that. 4. Once everything was back together, I booted up the computer, and checked to make sure it was working fine. I put the 120 GB drive into the external enclosure, and I'm going to keep the data on it until I'm really sure everything is working 100%. After about four weeks of using the computer, I have encountered no problems. Eventually I'll wipe the 120 GB and use it as a backup, or for offline storage. A quick blog to update the world about my reading activities. I wish I had some time to write full reviews, but I can say that all of the books below are highly recommended if you're into music. Lady Sings the Blues - by Billie Holiday with William Dufty. This is an autobiography of Lady Day, one of my favourite jazz singers. 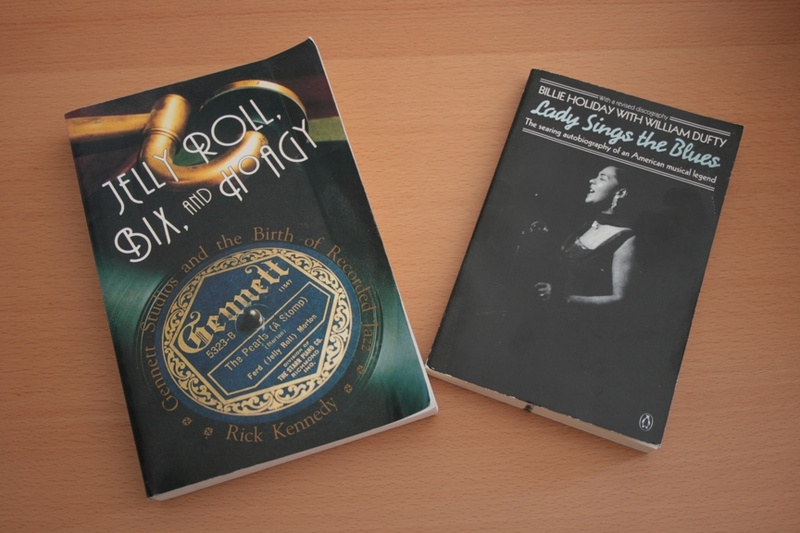 A short but revealing book about her life, addictions, how she was exploited by others, etc..
Jelly Roll, Bix, and Hoagy: Gennett Studios and the Birth of Recorded Jazz - by Rick Kennedy. Gennett was an early recording studio and label started in 1915 by a piano manufacturer. An early recording pioneer using acoustic/wax recording facilities, they recorded numerous jazz greats: Jelly Roll Morton, Louis Armstrong, Hoagy Carmichael, and many more. Johnny Cash : The Life of an American Icon - by Stephen Miller. Icon is right. A good bio following his life from his beginnings with some part-time musicians/full time mechanics (Marshall Grant - bass, Luther Perkins - guitar), how they caught the ear of Sam Phillips at Sun Studios with their unpolished brand new sound, through his on-again off-again pill addiction, erratic behaviour, connection with the Carter family, and so on. Fascinating character. 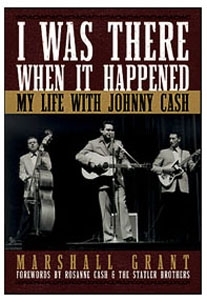 I Was There When It Happened : My Life With Johnny Cash - by Marshall Grant. It's the whole Johnny Cash story from the perspective of his long-time friend, bass player and road manager. It's not a really well written book - a little disjointed at times - but it's very interesting to hear the story from someone who really was there. Soulsville, U.S.A. : The Story of Stax Records - by Rob Bowman. Stax was an important studio/label in Memphis, TN in the 1960s and 1970s. Greats such as Carla Thomas, Booker T and the MGs, Steve Cropper, Duck Dunn, Otis Redding, The Staple Singers, Sam and Dave (and many more) recorded there. This is quite an in-depth book following Stax from its inception to its ultimate financial demise. Quite fascinating. I also bought a 9 CD compilation of Stax's singles to get the aural perspective. A lot of great music came out of Stax, but many of the names are not that well known because they were up against the Motown hit machine. Although Motown had some great stuff, I think Stax deserves greater recognition. Catch A Fire: The Life of Bob Marley - by Timothy White. Great bio on Bob Marley - lots of background and information on a reggae great. This is probably one of the better bios written about Bob. No Woman No Cry: My Life With Bob Marley - by Rita Marley. Another good read - from Bob's wife's perspective. I didn't quite finish the book 🙁 - I lost it at the Montreal airport last August (please let me know if you find it). More to come in a later post!